I have been on the road for about 10 days sitting in the airport at Atlanta waiting for my connecting flight to New York before leaving back home to Sweden. Its 11am here in Atlanta but it is as if you are on the road and in airports, there is no excuse to not order a beer. So I am trying the Samuel Adams Cherry Wheat, which indeed have a flavor of cherry in the beer - a bit strange at first. As usual there is no free wifi in the airports so I am killing time with the beer and writing this blog. The reason I am on the road was I spoke at two conferences and visiting some of our customers who are based in Las Vegas and Atlanta. 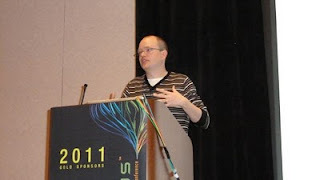 James Strachan and I did a co-shared talk at TSSJS in Las Vegas. This was the first time we tried that, but I think it went well. I covered the first 25 minutes giving the talk about what's Camel and kinda setting the scene for James to take over. He did a live demonstration of the cool new Fuse IDE he has been working on for the past time. Its Camel tooling. Its an Eclipse pluging which allows you to visual create and edit Camel routes, and as well easily run and test while you develop. FuseSource is planning on doing a full fledge webinar and I am sure to blog when that happens, as well as when Fuse IDE is released. I had the pleasure of meeting the Basement coders gang, and we had great talks, and even more heaps of fun with beers and dining. If you haven't listed to their podcasts, then I strongly suggest you give a go - its a top notch cast on the level of Javaposse. 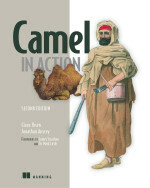 I also had the pleasure of meeting Kai Waehner, who is an keen Camel user, and was so kindly to write a review of the Camel in Action book at Amazon. He told me he is going to a conference in Austria and giving a talk about Camel - that's Camel love! Some attendees of the conference even brought along their copy of Camel in Action to have me sign them. It was nice to hear from readers that the book made a different to them, and helped them become successful with Camel. The TSSJS conference took place at Ceasars Palace, which is a upscale casino, and a very huge one I must say. You almost get lost finding your ways to the conference, and there is a lot of hallways to walk. but in reality its 100 feet tall trees. We set down in the foot of the canyon and had a quick snack and time for photos before we was on our way back. I arrived in Atlanta just in time to catch the sunday night dinner with the organizers of DevNexus and fellow speakers. The venue was a close by sports bar, and I enjoyed the laid back atmosphere and having solid burgers and beers. The DevNexus conference started on monday, which is very convenient, as we where three overseas speakers who spoke at TSSJS, who found their way to Atlanta. At the conference I had the pleasure of attending the advanced git talk, which thought me new tricks with the git command line. That comes handy on my daily work. In the evening there was the "cocktail reception" which manifested itself as another visit to the sports bar. I think that encapsulates the laid back atmosphere of the conference. However dont get me wrong, the conference was organized very professionally. In the hallway there was booths for vendors, the wifi worked, and they even had prices to hand out. Such as a number of Camel in Action books thanks to Manning for sponsoring. I had brought along a copy of the book as well, which I put out for giveaway as well. At the "cocktail reception" I had the pleasure of meeting great minds. Among others I had a nice chat with Mark Fisher, who is the lead on Spring Integration. He is a very friendly person and easy to talk to. We talked about work, sports, writing books and all sorts. And yes we didn't get into a "cat fight" despite we are leads on competing projects. Thanks to Vincent, Pratik, Gunnar and the others for organizing a great conference. I would like to come back next year, but I wonder if my wife wanna let me be on the road again for another 10 days.